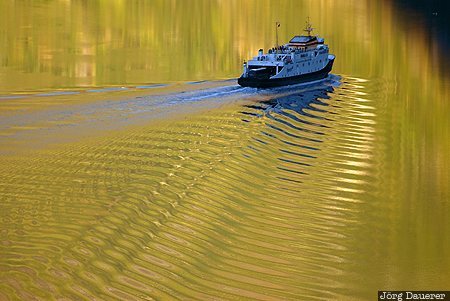 Warm morning light on the green mountains at Geirangerfjord creates reflexions and patterns in the calm water of Geirangerfjord as the ferry to Hellesylt leaves the fjord. Geiranger is in Moere og Romsdal in central Norway. This photo was taken in the morning of a sunny day in September of 2010. This photo was taken with a digital camera.